Little Bay Pet Services has been walking Cassie for more than two years now on a weekly basis since she was a puppy. 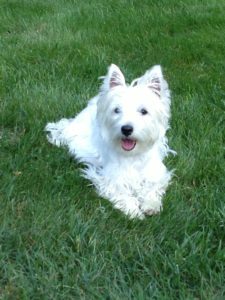 Cassie is an extremely quiet, yet sweet West Highland Terrier. 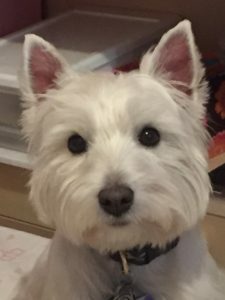 She excitedly waits at the top of the stairs when her pet sitter Linda arrives…with her tail always wagging! She is always happy to head out for a walk. There is a pond nearby that she likes to venture to also. In the spring and summer months, she enjoys watching the baby geese that have just been born. She is also intrigued by the chipmunks scurrying in the woods. She enjoys meeting humans, especially children along the way. Loud cars and big dogs are a little scary, but small dogs are her friends. If the weather is inclement, Cassie is just as happy to engage in a game of “chase the toy” indoors. Cassie has so much fun when her cousin Daisy visits! 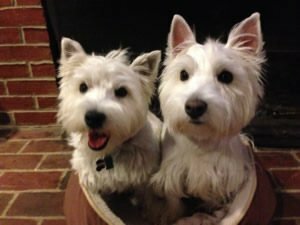 Daisy is the more vocal of the two dogs. She has a lot to tell her pet sitter. 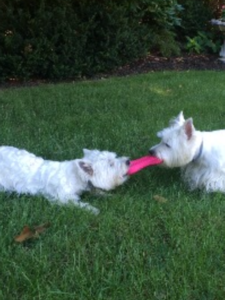 Daisy and Cassie play hard in the yard when Daisy spends the week with the family. Cassie really enjoys the company. At the end of the visit Cassie especially looks forward to her treat…a kong filled with peanut butter.